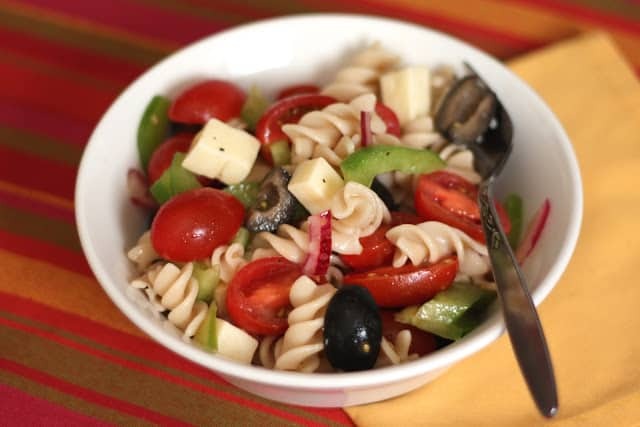 In the summertime, we tend to eat as light as possible on the hottest days of the year. While we aren’t yet to the hottest days, a storm came through this week and created a lovely muggy 108 degrees. After a crazy day of indoor activities with restless kids, I couldn’t even imagine turning on the oven of the stove for anything more than the pasta. 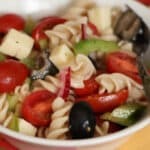 This salad turned out light and flavorful with a great balance of tanginess from the vinegar and a slight bite from the onion and olives. The pasta was even more delicious the next day. Cook the pasta according to directions, removing from the heat and rinsing immediately with cold water, until the pasta is cool. Set aside in colander. Place the onions in a small dish and cover with the olive oil and vinegar. Let rest while preparing the rest of the vegetables. 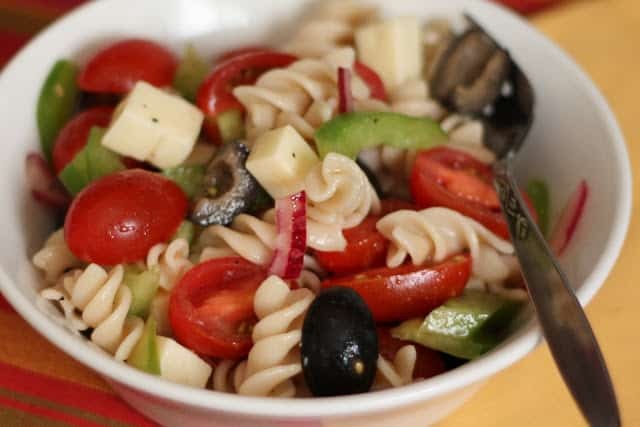 In a large bowl, combine the prepared vegetables, pasta and cheese. Add the onions with the vinegar and oil and toss well to coat thoroughly. Season generously with salt and pepper. Chill until ready to serve. Enjoy!